Yes, we did three days of Ocean/Water Mom Camp!!! It was something of a catch-all category that includes: Ocean animals, pirates, mermaids and anything else that could be thrown in for fun. I had the bright idea of taking the family on a stay-action to Mandalay Bay. My plan was to take full advantage of the amazing pool there. They have a wave pool, lazy river and a beach, plus of course normal pools! We checked-in early and went straight to the pool. We soon discovered that The Princess was too tiny to use the wave pool. This really upset her and caused a lot of disappointment. We got in about three hours at the pool before the Vegas summer monsoons struck. Then it was off to the room. I was planning to have the kids watch a pay-per-view movie in the room. But they didn’t have any!!! I guess they want you down at the gaming tables. Luckily I had a few simple crafts. 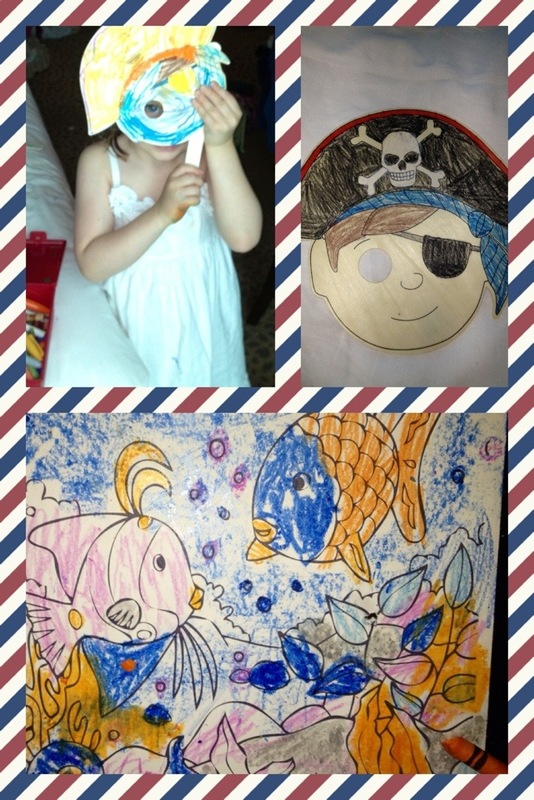 The wooden pirate masks that the kids colored. A mermaid coloring book that lets you design the mermaids faces with stickers. Still, the crafts didn’t last long. Then we rode the tram around between the Luxor and Excalibur SEVERAL times!!!! Then next day we hit the pool again. This time we had a much better time. Cinco started out scared of the wave pool. But he finally got into it. Plus The Princess found a kids pool area that she enjoyed and even caught a few ‘mini waves’ as she called them. After paying $40 for some inner tubes the kids played in the lazy river for quite awhile. After checkout we went to Shark Reef. We have been several times before, but the kids love it! Back home the following day, it was crafts galore! 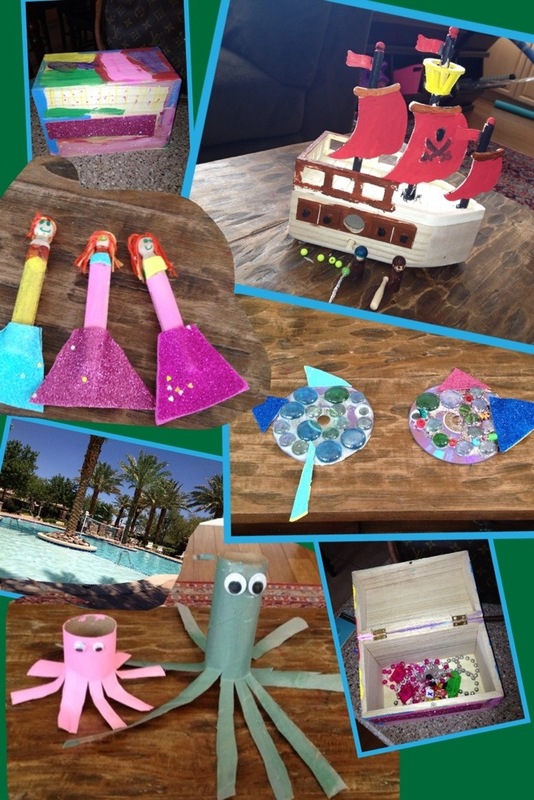 Cinco painted a pirate ship bird house and some wooden pirate peg dolls. The Princess designed a treasure chest! We also made cute clothes pin mermaids! The idea came from Disney Family. But, as you can see they are pretty basic. From Brilliant Bundles we borrowed the idea of the fish CD. Again, simple. Next up, octopus crafts! From Mom to 2 Posh Little Divas, we got a crazy easy octopus craft. Wait? You read the blog?? Yes I am a reader of the blog.